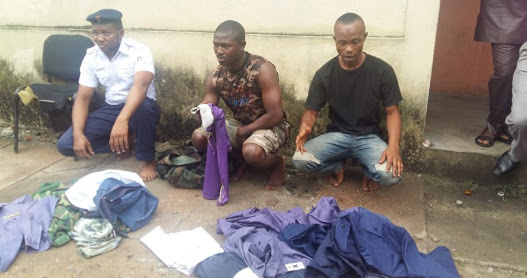 Policemen attached to the Assistant Inspector-General of Police (AIG) Zone II, Onikan have arrested a fake naval personnel, Kingsley Chukwueke, 26, and two others for robbery. They also operate with charm. Chukwueke, a motorcyclist Chidi Ibrahim and a tailor, Alaba Akanni were paraded on Tuesday by the zonal spokesperson, Dolapo Badmos, a Superintendent of Police (SP). According to the police, Chukwueke and Ibrahim attacked a motorist, Pascal Umeh-Okafor on Friday night on Ijora Bridge and dispossessed him of his money, phones and car key. They were however unfortunate as a patrol vehicle on surveillance in the axis, suspected something was wrong and arrested the suspects when they arrived the scene. Narrating how he was attacked, Umeh-Okafor, a trader, said the suspects double-crossed him with their two motorcycles in traffic. He said he obeyed them when he saw that Chukwueke was on uniform and decided to know what his offence was. According to him, they initially accused him of hitting another motorists despite that there was no car in front of him. He said they slapped him and hypnotised him, such that he didn’t know what was happening to him. Umeh-Okafor said: “When they double crossed me, they surrendered me and collected all my phone, phones and car key. They robbed something on me such that I didn’t know what was happening to me. Denying the robbery allegation, Chukwueke said that he only searched the complainant because he breached their agreement. He admitted he was not a naval personnel, adding that he bought the material for the uniform at Badagry Market and gave it to Akanni to sew for him. He said: “I bought the material at Badagry and gave it to a tailor to sew for me last year. I just sewed the uniform. I have been trying to join the military or police since 2006 without success. I love the navy and so, I got their uniform so that if I am taken, I would know I have a uniform already. “I was not wearing the uniform. It was inside my bag. I didn’t steal from the complainant. I was riding my bike when I saw the complainant arguing with another person. It seems he hit the person’s car and they were arguing. So, I stopped and introduced myself as a naval personnel. "The complainant begged me to settle his dispute with the other party, that he would pay me N3, 000. I settled their differences and he paid the other N1, 030. But when the man left, he refused to give me my own N3, 000 and brought out N1, 000 that it was all he had. “I refused and told him that wasn’t our agreement and he said I should search him if I would see any money on him. The mistake I made was that I searched him. It was while I was searching him that police came and got me. I am not a robber and I didn’t steal anything from him. “I was carrying a bag that had the uniform in it. I am aware it is a crime to have security uniform when I am not a personnel. The person who gave me the crest on my barrette is dead. They called him Marcus Mighty. He gave me the crest before I left Lagos by the time I came back, they said he was dead. I don’t know if he’s a real naval personnel but I used to see him on uniform. Ibrahim also denied being a robber, insisting that he only stopped by when he saw his colleague, Chukwueke with the man. He said aside being a motorcyclist, he’s also an assistant to health officers. “I am a scout. I have my ID here. I was wearing the military singlet inside. I bought the singlet and short at the market. There was traffic and I took passenger from Wharf to Ijora. It was on my way back that I saw this bike man (Chukwueke) and the complainant dragging. I didn’t come down from my bike. I even gave them some distance and was watching what was happening. “I asked them why they were arguing. I saw the bike man doing as though he was searching the complainant. In no time, I saw policemen there. I was still where I stood watching them as they were explaining to the police. It was where I sat on my bike that the driver came and held my bike. I thought he wanted me to be a witness but later the police came and they told me to follow them. Akanni, a resident of 103, Mosafejo Street, Iyatoro, admitted sewing the uniforms for Chukwueke and his friend, Williams. He said that they showed him identity cards that they were naval personnel, adding that he charged N500 for each of the uniforms because he was happy he had naval personnel as customers. The police also arrested a fake cop, who specialises in escorting vans and trucks. Alex Agbo, 38, was arrested around Iyana Ipaja, while onboard a van laden with iron rods. According to Badmos, he claimed to be a Spy police, but was caught with police attire. Badmos said: “The zonal command has been inundated with lots of complaints that security men on illegal duty were disturbing motorists. “Men of zonal al X-Squad were activated to find out what was happening and a fake policeman was arrested. Upon investigation, it was discovered he was not a policeman and he adorned police uniform. He claimed to be Spy, which he was yet to prove. Even as a spy, he was not supposed to be on police uniform.